The below artworks are the most important by Corita Kent - that both overview the major creative periods, and highlight the greatest achievements by the artist. Artwork description & Analysis: The Lord Is With Thee was Kent's breakthrough piece after graduating from her MA program at the University of Southern California. Kent remembered of her last year at USC, "[D]uring that course I made two prints. And the summer following that, I looked at one of them, and it was really so bad that I started adding colors on top of it, making a completely new print, which is that print hanging over there called The Lord Is With Thee. It turned into a completely different picture because underneath it was a picture of the Assumption, with a very, as I remember it, a kind of fashion-modelish lady in the center. It was a very unwhole picture." In many ways, the composition is traditional, showing the veiled and crowned Virgin Mary with her hands raised, surrounded by haloed saints, angels, kings, and shepherds. Influenced by Byzantine and medieval art, which Kent had studied at college, the flat, two-dimensional style lends itself to the screen printing process. Yet in other ways the print is far from traditional. The scene is a riot of garishly celebratory color, with uneven lines and simplified figures. The searing yellow overlaps messily with the deep blue background and pastel pink detailing, while many of the figures are roughly filled in with earthy brown. Brushstrokes and drips of color are left visible in this print, clearly an early example of the influence of the Abstract Expressionists. 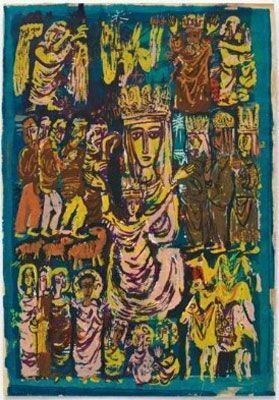 Even in this early and most traditional of her works, Kent's idea of a celebration of the heavenly Madonna did not necessarily coincide with the more conservative Catholic taste of 1950s Los Angeles. Artwork description & Analysis: By 1962, Kent's art had changed significantly, having taught for many years and travelled to new places. The world had become more consumer-driven, and Hollywood was suddenly engulfed by advertising, branding, fashion, music, and movies. 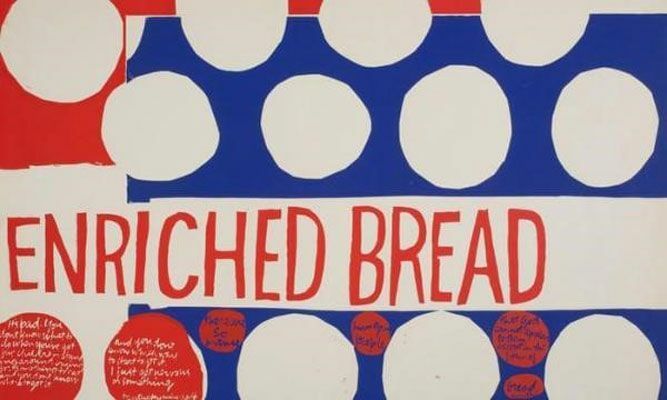 With this cultural background in mind, when Kent saw Andy Warhol's work for the first time in 1962, her immediate response was a print called Wonderbread. In 1964 Kent developed the idea, creating a print called That They May Have Life (Enriched Bread). Kent took inspiration from the wrapper for Wonder Bread, where she noticed these same circular shapes were used to decorate the packaging. In her reproduction of the advertising, these shapes, paired with the phrase "enriched bread," transforms the geometric packaging design into a symbol of the Eucharist, the consecrated bread that Catholics believe is the body of Christ, which they consume in the Communion ceremony that commemorates the Last Supper. Here, Kent incorporates, or sees, Christ in the everyday, a real presence in the modern world, yet the piece also contains a social commentary on hunger. On the left side, Kent included a quote from a Kentucky miner's wife, talking about her struggles to feed her five hungry children. And across the smaller red circles, a quote from Gandhi: "There are so many hungry people that God cannot appear to them except in the form of bread." The two speakers, a poor white woman and a famous activist, are given equal space in the composition and so too their insights. By combining the written and the visual, Kent plays on the languages and graphics of advertising in early 1960s America, while imbuing them with real social and spiritual significance. Artwork description & Analysis: In 1964, Sister Mary Corita appropriated the label for Del Monte tomatoes, whose tagline, "The Juiciest Tomatoes of All," became the basis for a print. The screen print perfectly represents Corita's use of what she would term "Footnotes and Headlines." 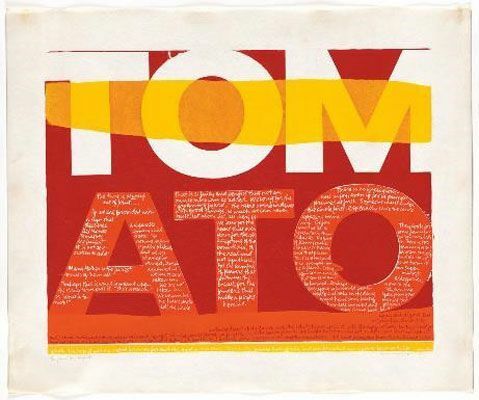 She uses the "headline" of the word "tomato" in bold, supermarket-like lettering, making it reminiscent of a billboard advertisement or logo. An easy to understand and recognizable reference, it draws the viewer into the composition, and once drawn in, they then encounter the "footnote," the smaller, cursive writing inside the letters, which declares: "Mary Mother is the Juiciest Tomato of All"..."Perhaps this is what is meant by the slang 'she's a peach!' or 'what a tomato!'" Some saw such language - describing the Virgin Mary as a "juicy" tomato - as sacrilegious because of its sexual connotations. This "footnote," or supporting text, completely transforms the meaning of the "headline" text. The word "tomato", rather than being a quotation from a food brand, becomes something imbued with the divine. It becomes a part of the everyday world in which the spiritual can shine through in a real, embodied way. The new Vatican II directives included combating world hunger, and Kent reclaimed the capitalist use of language to promote that goal. With characteristic humor, Sister Corita appropriated pop language for her own uses, allowing her to demonstrate the way in which the generosity, kindness, and abundance of the Mother Mary and Christ can be found in modern day-to-day existence. Sister Corita wrote that "in a way, all the words we need are in the ads." While her contemporaries Jasper Johns, Jim Dine, Robert Indiana, and Edward Ruscha also played with language in their Pop compositions, none imbued it with Kent's spirituality. Despite her differences from Andy Warhol, he was fascinated by her work, perhaps because of his own complicated relationship with Catholicism. In 1965, an Immaculate Heart Sister wrote of Sister Corita's yearly winter exhibition, "The opening is crowded with fans. Andy Warhol is there. He would be captivated by the idea of an artist nun, especially one who uses Wonderbread wrapping as a symbol for Eucharist." 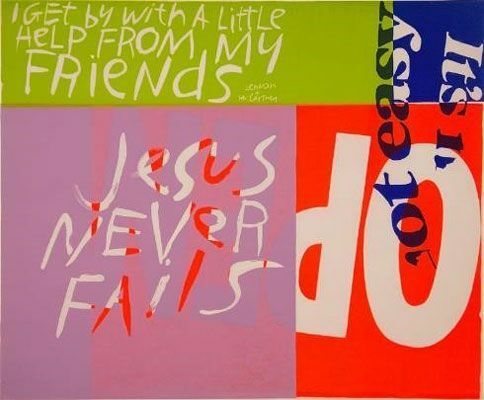 Artwork description & Analysis: Jesus Never Fails is typical of Corita Kent's mid-1960s output. At this time, she was fully committed to Pop but still enveloped in the Immaculate Heart community and unwilling or unable to transparently produce protest art. However, her prints from this time obliquely suggested a kind of social protest against despair and disillusionment, encouraging hope and positive action. A classic Pop arrangement, brightly colored blocks divide the space, in the way brand names, logos, and slogans divide billboards and packaging. The tightly controlled shapes are interrupted with snippets of phrases which cross the boundaries of squares and are, in some instances, written at a slight angle. The typography is interrupted, rotated, flipped, or cut up, making the viewer concentrate on working to excavate meaning from the words, a process distinctly different from the passivity of advertising. Each phrase featured in the composition seems disconnected from the others: from the religious "Jesus never fails" and the demand "DO," to the inscription "It's not easy" and the Beatles lyric "I get by with a little help from my friends." A typically eclectic mix of references, when taken together they leave the viewer with a simultaneously vague but distinct message: life is hard and hope is not easy, but if one commits oneself to living actively, in awareness of the presence of God and friendship, hope can be found. When considered in the context of 1967 California, known for the Summer of Love, Jesus Never Fails becomes part of a wider call for focus on harmony and spirituality. Artwork description & Analysis: In 1962, Pope John XXIII formed Vatican II, a reforming council that aimed to modernize Catholic Church. The council stressed increased dialogues with other religions and the use of vernacular (non-Latin) language, music, and artwork in the church. John XXIII said that it was time to "open the windows [of the Church] and let in some fresh air," but by 1968, Kent and the Immaculate Heart sisters were on rocky footing with the archdiocese in Los Angeles. The nuns (especially Sister Corita) took these changes to heart and aimed to form their lives, community, and art around this new, modern Catholicism. Yet, while these seismic changes were discussed in Rome, many leaders in America did not welcome the new directives. The Archbishop of Los Angeles, Cardinal James Francis McIntyre, was highly conservative and strongly objected to what he described as Sister Corita's "weird and sinister" art. 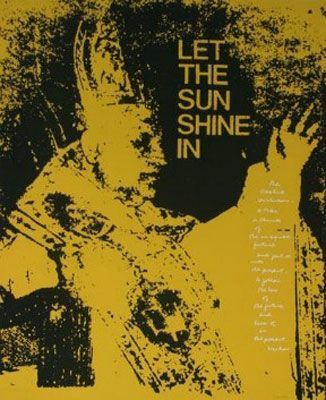 Showing a bright yellow, grainy image of Pope John XXIII, the print was accompanied with the text "LET THE SUN SHINE IN." The phrase appeared in the 1954 song "Open up your heart (and let the sunshine in)" by Stuart Hamblen but was reprised in the 1967 countercultural musical Hair, whose number "Aquarius (let the sunshine in)" became extremely popular. The combination of text and image appeals to the leaders of the Catholic Church to allow the promised "fresh air" and sunshine in, by accepting new ideas and attitudes. To add to the print's revolutionary call to the church, Sister Corita quoted Arthur Waskow, the revolutionary Rabbi linked to the Jewish Renewal Movement of the time: "The creative Revolution - to take a chunk of the imagined future and put it into the present - to follow the law of the future and live it in the present." She goads the American Catholics, suggesting that if figures like Waskow succeeded in modernizing Judaism, why not Catholicism? 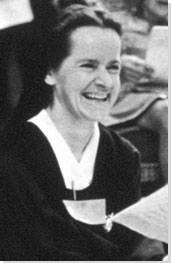 Yet, it is likely that Sister Corita's 1968 print Let the Sunshine In was a final straw for the Cardinal. After a sabbatical, by the year's end, the disapproval of the Archbishop was too much for Corita, and she officially left Immaculate Heart College and the life of a nun forever. 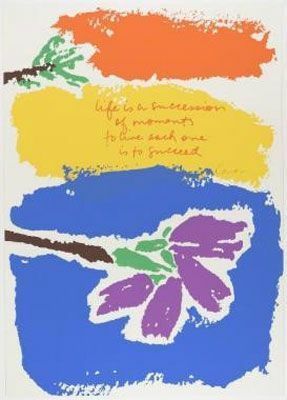 Artwork description & Analysis: By 1969, two key changes affected Corita Kent's screen-prints; she was freed from the censorship or pressure she was under as a nun formally serving the Catholic Church, and it was clear that the Summer of Love was definitively over. The gentle calls for peace and love had given way to angry protests and a mass of political unrest in the United States, most forcibly, in outrage at the continued American involvement in the Vietnam War and in the riots following the assassination of civil rights leader Martin Luther King, Jr. While President Nixon said he was taking steps to end the war rapidly and promising to achieve "Peace with Honor," many American citizens felt appalled that honor could ever be a quality connected to America's actions in Vietnam. In addition to the tens of thousands of American troops who were killed and the hundreds of thousands wounded, over a million Vietnamese and Viet Cong fighters were killed as well as 2 million civilians through the brutal regime of bombing and chemical warfare. During this period, Kent produced a series of prints she entitled Heroes and Sheroes. 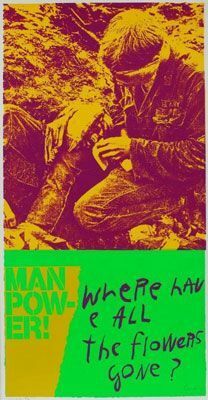 One of the prints, Moonflowers, addresses the occasion of the first man on the moon, but Manflowers takes on the casualties of the Vietnam War. A searing yellow and deep purple image tops the composition, showing two young, wounded American soldiers. One soldier crouches in the mud, tending to another with bandages as he lays on his back. Under the image, Kent printed two phrases: "Man Pow-er!" and "Where have all the flowers gone?" The second phrase is from a popular song, "Where have all the flowers gone?" written by the folk musician Peter Seeger. The song laments the loss of joyful youth through war and questions whether we will ever learn peace from deaths caused by war. The phrase "Man Power" is disjointed and ripped apart, and instead, these vulnerable young men are now Manflowers, rooted in the mud of the battlefields so many fought and died on. Artwork description & Analysis: In addition to the Vietnam War and world hunger, Kent was deeply and emotionally involved in the Civil Rights Movement. It Can Be Said of Them, also from the series Heroes and Sheroes, shows four men who she understood as martyrs for the cause of human equality. In the top left is a favored image of Christ that she used across many of her prints. In each of the other three corners are Martin Luther King, Jr., John F. Kennedy, and his brother Robert Kennedy. Each of these men were killed in response to their selfless, "Christian" work; just as Christ was killed on the cross, each of these Civil Rights proponents and politicians were assassinated. President Kennedy had been killed in 1963, while both King and Robert Kennedy were gunned down in 1968, just three months apart. In the center of the composition is a quote attributed to E.B. White after President Kennedy's assassination: "It can be said of him, as of few men in like position, that he did not fear the weather and did not turn his sails, but instead, challenged the wind itself to improve its direction and to cause it to blow more softly and more kindly over the world and its people." The "him" in this instance applies to all of these figures, who turn from each corner of the print to look in towards this central statement. They all become incarnations of a modern Christian martyr, who take the spirit of Christ's message as a call to be fearless in commitment to the change and betterment of society. This composition gives the effect of a closed circle of heroes; a kind of unity. It is significant that each man is given equal space to the image of Christ, including Martin Luther King, a black man. This equality of space impresses on the viewer a wider sense of equality. The gridded composition of orange and pink squares, with each man facing the center of the composition, creates a unified, circle of heroes, and while the print is reminiscent of a Christian triptych, Kent substitutes the biblical saints for modern-day heroes. Additionally, the piece also has affinities with contemporary protest and psychedelic rock concert posters, thus underscoring her belief that one does not only look back to the past but to the present day to find saints. Artwork description & Analysis: By the mid-1970s, Kent was approaching her sixties and suffering with her first diagnosis of cancer. Moving away from strident protest and political themes, her work became more introspective and philosophical about her own time on earth, exploring new modes of spirituality and becoming more aware of the natural environment. 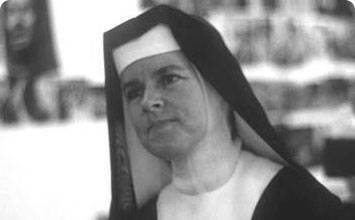 By 1977, both herself and her dear friend Sister Mary Catherine were suffering from cancer; Mary Catherine died two years later in 1979. After all of her focus on the fast-paced commercial and political world, these late prints reveled in the simpler and quieter things. Small simplified flowers in bright colors crisscross abstract strokes of pastel-colored hues and frame the understated but moving thoughts written in Kent's tiny cursive handwriting. Artist Julie Ault explains, "The handwriting - Corita's - became so recognizable in the 1960s that a type company produced it as a type-transfer sheet. The font Corita was used as a typographic blueprint for laying out Bible verses on church posters." Life is a Succession completely encapsulates the spirit of these late pieces. Rough orange, blue and yellow stripes are overlaid with simply painted flowers and delicate leaves. On the yellow plane, one reads, "Life is a succession of moments. To live each one is to succeed." A message of universal, yet simultaneously personal, wisdom, it encourages the reader to have hope, faith, and joy in every moment of their existence, as each is a blessing in itself. 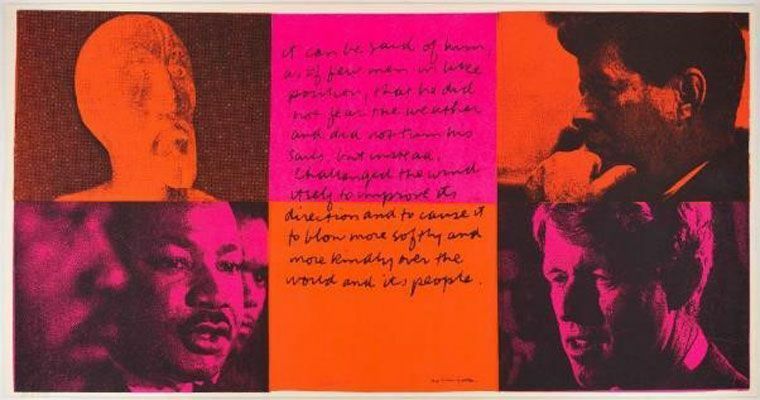 Even in the last few years of Corita Kent's life, as one critic put it, alongside her achievements in protest art and pop aesthetics "above all, her work sends a message of hope and love." First published on 13 Mar 2019. Updated and modified regularly.